Anatomy Physical Therapy (APT) provides a full sports service, 7 days a week, to athletes and teams. Our Therapists are qualified in a range of related sporting disciplines that render them ideal to provide a ‘one stop shop’ for all athletic and sporting club requirements. We currently provide this service to a number of prominent Gaelic and Rugby Football Clubs and schools in the Dublin area. Physical Therapy: Physical Therapy involves the manual treatment of soft tissue injuries which occur when playing sport, in areas such as muscles, tendons, ligaments and fascia (the connecting tissue). It is involved with evaluating and treating disorders of the musculoskeletal system. The ultimate goal of Physical Therapy is to eliminate pain and restore functional independence to each sports player. Sports Massage: We offer Sports Massage which includes pre and post sports massage. Massage is a very effective therapy for releasing muscle tension and restoring balance to the musculoskeletal system thereby optimising the athlete’s performance. Received regularly this can help athletes prevent injury, which might otherwise be caused by overuse. A constant build-up of tension in muscles from regular activity may also lead to stresses on joints, ligaments and tendons, as well as the muscles themselves. 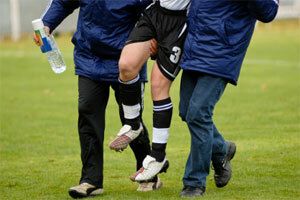 Sports First Aid: is a key component of the package of services provided to the sports team. It is concerned with the emergency treatment administered to an injured/sick person, in a sporting environment, before medical care arrives. At APT, our therapists are trained by the Academy of Emergency Care in Sports, a body approved by the Faculty of Sport & Medicine, Royal College of Surgeons of Ireland and Royal College of Physicians of Ireland. Taping & Strapping: Taping and strapping is the application of tape to an athlete’s injured joint in order to restrict movement or support a muscle group surrounding an injured joint that may be under pressure as a result of the injury . Personal Training: APT Therapists are qualified Fitness Instructors and so can provide Personal Training Programmes to individual athletes or to sports clubs in order to improve sporting performance in the areas of strength, endurance, flexibility or core conditioning through Pilates. Our total programme of activity also includes nutrition. For further details on any of the core services listed above, click on the links provided.